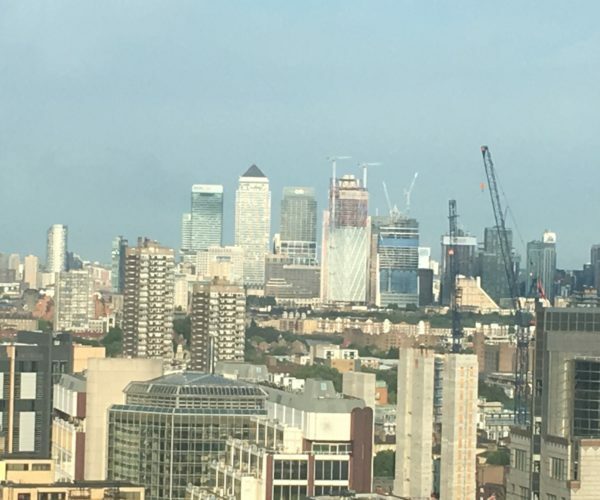 The no confidence vote narrowly lost by Labour MP Joan Ryan at the hands of her Enfield North constituency members on Thursday is but the latest episode in a long and complex local Labour power struggle. Ryan retained the then marginal seat in last year’s general election with ease, but though Corbynites put this down to the great appeal of “Jeremy”, Ryan herself made no secret during her campaign of her belief that her party leader was a liability she had to minimise. 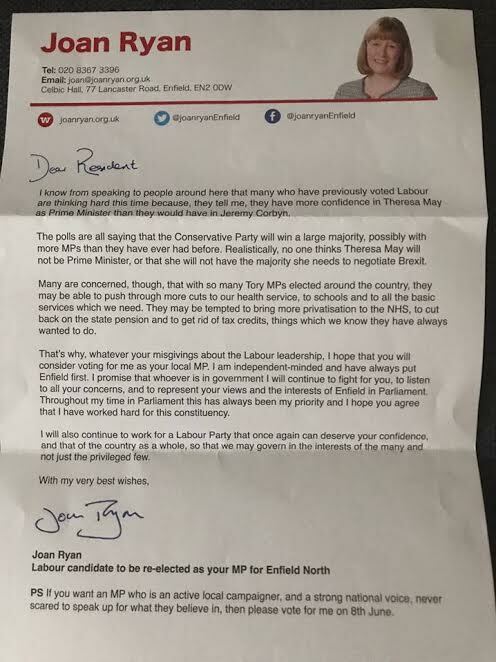 A letter she sent out to at least some Labour supporters told them she was aware that they had “more confidence in Theresa May as Prime Minister than they would have in Jeremy Corbyn” and that “the polls are saying that the Conservative Party will win a large majority” (as they were at the time the letter seems to have been sent). Her message was that people should vote for her again “whatever your misgivings about about the Labour leadership”. 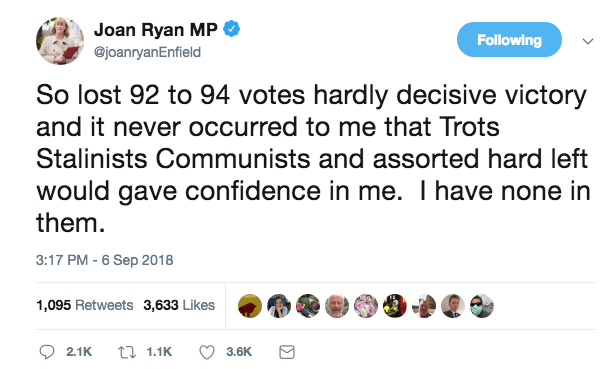 Given the loyalty cult surrounding Corbyn, it is hardly surprising that this approach displeased those constituency activists Ryan tenderly described in a tweet after their no confidence triumph as “Trots Stalinists Communists and assorted hard left” (and also, take note, one of the Guardian’s squad of Corbynite columnists, Dawn Foster). The antisemitism debacle that has engulfed Labour for months has provided them with the opportunity they craved to punish Ryan, who is chair of Labour Friends of Israel. All this needs to also be set in the wider context of Enfield borough politics. On 3 May, Labour increased its council majority, but its then leader Doug Taylor, who had been at the helm for eight years, was ousted eleven days later by Nesil Caliskan, who’d been a councillor for just three years. Taylor is regarded as a capable moderate, but had nonetheless been backed by Enfield Momentum. Why? The Morning Star, an organ of Corbynism, described Caliskan as “reportedly close to Ryan” but, more convincingly, there are Enfield Labour people who haven’t pitched their tents in Camp Corbyn who say the same. Indeed, they go further, complaining that Ryan has vigorously encouraged residents of Turkish or Kurdish heritage, many of them connected with a branch of Shi’a Islam called Alevism, to join the Labour Party and become councillors. Some have been elected, including after successfully de-selecting sitting councillors before the elections. A resulting influx of Turkish or Kurdish Londoners into the Enfield Labour Group appears to have greatly helped Caliskan, the youngest borough leader in the capital, to take Taylor’s place. This shift has been characterised as a “coup” brought about by ethnic and/or cultural entryism but, as ever, one person’s takeover plot is another’s healthy engagement with democratic grassroots politics. 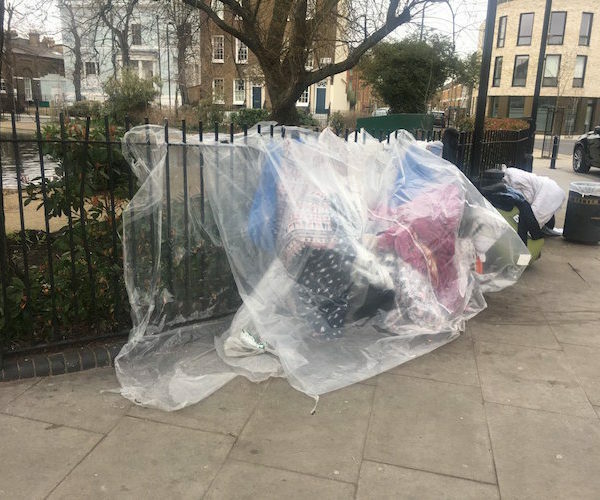 Also as ever the Enfield picture seems to be not quite as neat as portrayed by a certain sort of journalist – a point well made by the more measured coverage of the Palmers Green Community website in July. Some on the “patriotic” far right have lapped up the story as it was told in the Sunday Times. Caliskan’s response has been that “the right wing press has been fed with false accusations in an attempt to damage the Labour council” and called the Sunday Times piece “nothing less than a disgraceful smear designed to create conflict within our party on the basis of ethnicity”. As shown above, it’s not only right wing news outlets who’ve taken the “coup” approach to what has been happening in Enfield. Skwawkbox, another Corbynite propaganda conduit, has put out a series of bulletins about councillor deselections, stressing the removal of black councillors and calling it a “‘coup’ by the Labour Right in Enfield” and a “right wing purge”. There have been formal complaints from Enfield party members about the selections procedure, which Caliskan herself was involved in and has defended. Having previously given it the all-clear, Labour’s governing National Executive Committee said in July that it would conduct an investigation, a moved backed by around half of the council’s cabinet. Some have also voiced private complaints, including to On London, about Caliskan’s leadership style. The leader of the Conservative opposition, Joanne Laban, has called Enfield a “council in chaos”. It seems she might not be wrong. 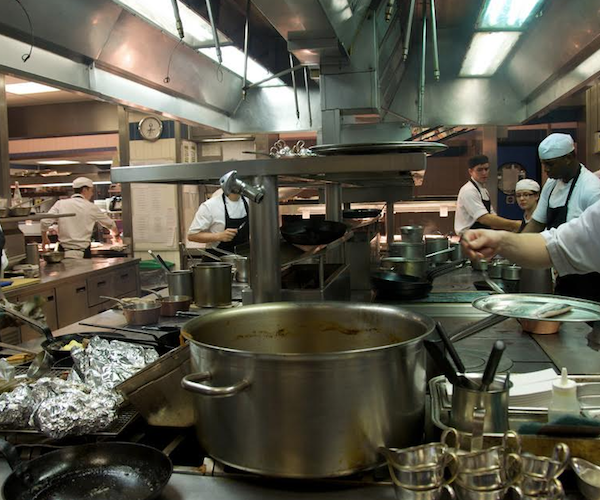 What is the clearest way to characterise this tangled tale? Left versus Right? Entryists out-organised by other entryists? Ethnic group purges other ethnic group? Vibrant democratic activism in revitalised Labour movement? None of them seem quite up to scratch. More clarity on all this to come. Maybe.